This is a thing, I guess. 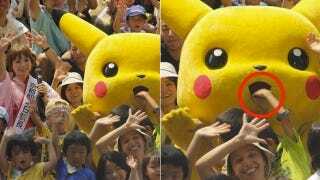 Children in Japan continue to cram their hands in Pikachu's open mouth—most recently, at a Pokémon event in Kyoto with celebrity Shoko Nakagawa. STOP IT, KIDS, JUST STOP IT.